Meditations is perhaps the only document of its kind ever made. It is the private thoughts of the world’s most powerful man giving advice to himself on how to make good on the responsibilities and obligations of his positions. Trained in Stoic philosophy, Marcus Aurelius stopped almost every night to practice a series of spiritual exercises—reminders designed to make him humble, patient, empathetic, generous, and strong in the face of whatever he was dealing with. It is imminently readable and perfectly accessible. You cannot read this book and not come away with a phrase or a line that will be helpful to you the next time you are in trouble. Read it, it is practical philosophy embodied. Despite his privileges as an Emperor, Marcus Aurelius had a difficult life. The Roman historian Cassius Dio mused that Marcus “did not meet with the good fortune that he deserved, for he was not strong in body and was involved in a multitude of troubles throughout practically his entire reign.” But throughout these struggles he never gave up. He is an inspiring example for us to think about today if we get tired, frustrated, or have to deal with some crisis. And during those years of struggle, particularly while he was directing military campaigns, Marcus would write twelve books of his private journals, which is estimated to has been between 170 and 180 A.D. They have become one of the most influential philosophy books in the history of the world. 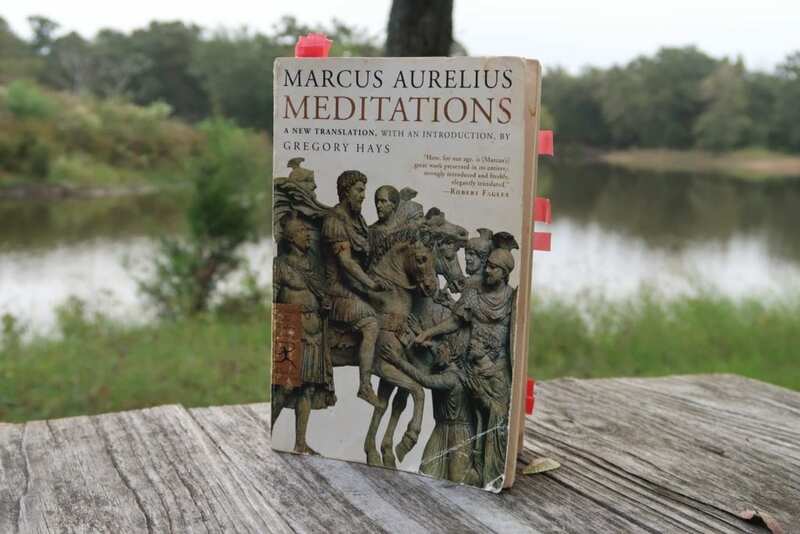 Meditations originally had no title and was written by Marcus Aurelius for his own benefit, not for an audience. And it’s funny to think that his writings may be as special as they are because they were never intended for us to be read. Almost every other piece of literature is a kind of performance—it’s made for the audience. Meditations isn’t. In fact, their original title (Ta eis heauton) roughly translates as To Himself. It’s for this reason that Marcus Aurelius’s Meditations is a somewhat inscrutable book—it was for personal clarity and not public benefit. Writing down Stoic exercises was and is also a form of practicing them, just as repeating a prayer or hymn might be. It is a book of short sayings, varying from a sentence or two, to a long paragraph. It’s not organized by theme, but certain ideas keep popping up throughout, indicating that he thought them the most important for him (and therefore us) to understand and incorporate into the way we live. The fact that Marcus goes to the same themes illustrates how much of Stoicism is essentially journaling and going over the same ideas. You need to constantly remind yourself of the standards you have set for yourself, who you aspire to be, and these are especially important when you come short. This is a book of actionable advice and its teachings were meant to be practiced and used. When Marcus speaks of the certainty of death and how relatively soon it will come, he is not idly philosophizing. He is recommending that this fact advise our decision-making and how we view the events in our lives. Instead of theorizing about what we should do if either there is a guiding intelligence in the universe, or if everything is just atoms, he prescribes one viewpoint that typically follows Stoic thinking, and explains why both possible truths would lead to the same best actions and beliefs. The first book of Meditations consists of Marcus thanking the people who had a positive influence on his life, with a focus on those who instilled in him traits characteristic of a good Stoic. These include valuing reason above all else, not being absorbed by petty things, limiting passions and desires, sober decision-making followed by firm commitment to the choice made, honesty and never being secretive, cheerfulness in the face of obstacles, and avoiding superstition and the influence of sophistry. The character traits he lists throughout this first book include many examples worth following and ought to be paid close attention to. Below are some of the major themes that recur throughout the book. Five of the main themes in this book are: change, death and the shortness of life; the role and importance of the rational mind and will; dealing with others and accepting their shortcomings; avoiding the chase for pleasure and fame; and living according to nature and fully accepting its course. Marcus reminded himself to not be upset by the misdeeds of others and to correct them if possible, but if they were stubborn and would not change, to accept it. In reacting to such people, we must never allow our own principles to be violated. Moreover, we should never be surprised by the wicked deeds of others, and avoid wishing that men are not as they are (prone to evil acts) because then we are wishing for the impossible. He believed that people do bad things out of ignorance of what is good and evil, and that we should forgive them for their errors, even when they harm us. Marcus stresses that social animals such as humans are meant to live in harmony. He likened his relation to bad people to them being different body parts of the same person. Good and bad people are both part of the same universal nature and they are meant to interact and cooperate. Marcus Aurelius—and indeed all the Stoics—believed that we were part of an inner-connected organism. That you couldn’t hurt one person without hurting them all. “What injures the hive, injures the bee,” he said. “The best revenge,” he said, “is not to be like that.” Meaning: When you hurt others, you hurt the group and you hurt yourself. And today, in a hyperconnected, information driven world, compared to Marcus’s time, we also know a lot about other people. We know about the comings and goings of celebrities and politicians. We get real time updates on everything our friends do. We see what they say on social media and we get their texts and photos. There’s no question that this has increased the amount of so-called drama in our lives. We have opinions on whether so-and-so should have done this and we watch the media chatter about it. We get offended when our friends say this or that. Not a day goes by that we don’t hear gossip or speculation about someone we know. This is a trap. This is a distraction. Even 2,000 years ago Marcus knew this. “Other people’s mistakes?” he reminded himself, should be left to their makers. Forget what other people are doing, forget what they’re doing wrong. You’ve got enough on your plate. Focus on yourself—focus on what you might be doing wrong. Fix that. Keep an eye fixed on your own life. There’s no need—and frankly, there’s not enough time—to waste a second spying on other people. Fame, no matter how great, will always fade into oblivion and pursuit of it merely demonstrates one’s vanity. He also explains that nothing is made better by praise, the beauty of things comes from the thing itself and not what people say about it. To think then that we are gaining something by being praised is a mistake. Marcus and the Stoics see doing good as the proper job of a human being. So why on earth do you need thanks or recognition for having done the right thing? It’s your job. Why would you need to be famous? Because you were talented? Because you were brilliant? Because you were successful? These things are part of the job too. The desire for fame is just one of the pitfalls in life. There are many other desires, all of which can potentially lead us to act immorally. He cites a philosopher, Theophrastus, who claims that bad acts committed because of desires are more blameworthy than evils done out of anger. A person who has been harmed was wronged, whereas the person with strong desires is ignoring the well-being of others because they want something more than they want to be virtuous. Desires can also lead to despair. Marcus addresses this when he talks about prayer, claiming that one should not asks the gods to satisfy a desire or prevent something feared, but ask them if they can remove the desire and be okay with whatever life gives to them. Marcus Aurelius’s strongest philosophy comes when he speaks on the eternally changing nature of the universe and the acceptance of death. He reminds us that all of us will die, however, we only ever lose the present moment because that is all we ever have. Nobody “loses more” by dying early. The longest and shortest life will end the same way and be finished for the same eternity. He also reminds us that we could die at any moment and to live to the fullest while we still can. It is the way of our world that substances should change into new things. The changing of anything into something else is never harmful to the universe, and Marcus applies that lack of harmfulness to every part of the universe, including us. “Nothing is evil which is according to nature,” he asserts. Events can cause people to lose their cool and act immorally, but still they are not harmed by the events, but rather their reaction to them. *This is the quote that inspired the bestselling cult Stoic classic, The Obstacle Is the Way. It shows how some of the most successful people in history—from John D. Rockefeller to Amelia Earhart to Ulysses S. Grant to Steve Jobs—have applied Stoicism to overcome difficult or even impossible situations. Marcus knew that our ability to reason is what sets us apart from the animals and is an important power that we must use to the fullest. He believed (like all Stoics) that our reason could be used to understand the universal reason present in nature, which would lead to agreement with it even if events seemed harmful. Our rational minds have complete power over our opinions and the mind only experiences suffering when it itself creates a desire for a specific outcome in life. Marcus teaches that our mind is a thing that controls itself completely and is separated from the world; it cannot be affected by events unless it makes itself be affected. Every appearance is the result of what the mind wills it to appear to be and the mind makes itself exactly what it is. Since this is so, there is no reason we should not agree with nature, since nature has provided us with the means to rationally accept the course of events no matter where they take us. People will always do awful (or at least unpleasant) things and we are only responsible our own virtue. We can choose to be good even when we are surrounded by wrong. When another harms us, we can react with kindness, advising them of their errors if possible but being okay with it if they ignore this advice. When another angers us, we must immediately consider their point of view, remember that we have our own faults, and respond with positivity and indifference to any supposed harm done to us. The deepest lesson in Meditations relates to our mortality and the shortness of life. We shall soon be replaced, and we ought not waste our lives being distressed. We should focus on doing good for the others with the unknowable amount of time we have left to live. To make this a part of our lives we must reflect regularly on the fact that we will die. This can result in some of the deepest understandings available to humans, therefore death should be confronted no matter how unpleasant it may be to think about. We should reflect on all the people that have come before us, what is left of them now, and what will later be left of us. Theodore Roosevelt, after his presidency, spent eight months exploring (and nearly dying in) the unknown jungles of the Amazon, and of the eight books he brought on the journey, two were Marcus Aurelius’ Meditations and Epictetus’ Enchiridion. Chinese leader Wen Jiabao has re-read the book on countless occasions. Marcus’s writing also makes a prominent appearance in Steinbeck’s East of Eden, in John Stuart Mill’s On Liberty, and of course many people know Marcus Aurelius from the popular film Gladiator, where he is the old and wise emperor at the beginning of the film played by Richard Harris. The best Meditations translation is by Gregory Hays. (Sign up for our free 7-day course on Stoicism to see our interview with Professor Hays). He writes in modern plain English and understands how to make Marcus’s words concise and fluid. It is highly recommended you first read the Hays translation. The best free translation, is by George Long. It can be found here. It has some old English in it, with “thee” and “thy” but if you’re looking to test some of the material before purchasing a copy it is a decent place to start. Of course, The Daily Stoic also offers all-new original translations of Marcus from Meditations as translated by Stephen Hanselman.